The Photographer’s Oil Collective is designed to partner with professional photographers. But we also work with enthusiasts on a space-available basis to create heirloom paintings from personal and family photos. The enthusiast route was my first foray into the high-end, photo-to-painting experience. 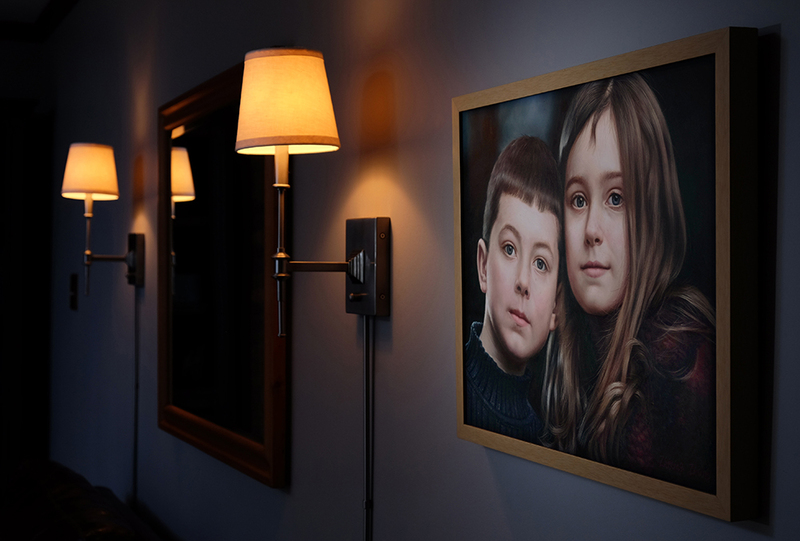 In 2012 I commissioned artist Zhixing Zhang to paint a photograph I had taken five years earlier of my kids. I had looked at that image as a photo hundreds of times. And I knew the painting was coming. Still, seeing it for the first time was a surprisingly emotional experience. The first thing I noticed was how much detail had been captured in oil. Painters create the illusion of detail very differently with their brushes than we do with our pixels. They layer, they blend, they use different types of brushes and techniques. Skin looks organic and luminous. The top layer gets single-hair detail, something for which brushes are ideally suited. It’s quite the first impression. Then it hit me that Zhixing Zhang spent months painting my children’s faces, and that his painting might be the only visual record of them that will exist in a couple hundred years. I was floored as I opened the painting. Especially considering I already knew what was inside the tube as I was opening it. My wife, on the other hand, did not know what was coming when she opened the painting as a gift on Christmas morning. She was overwhelmed. It was then that I started to understand the appeal of an oil painting as compared to a photograph—the uniqueness, the attention to detail, the person-hours involved, the permanence. Our painting, seen at top, has hung in the living room for a couple of years now. And I continue to study it, every single day. Working photographers can expand this experience beyond one family’s living room. The Photographer’s Oil Collective enables you to confidently offer world-class oil paintings for your clients at accessible prices. Whether you shoot corporate, traditional portraiture, weddings, engagements, seniors or other niche portrait specialties, working with POC will add a new wing to your business. Will you disrupt a traditional market or create a new one? The choice is yours. That’s a lot to digest. In fact, it’s more like a three-hour discussion over drinks than it is a web page. So we have put together an information packet on how to work with POC as a professional photographer. Also included are several 2000-pixel image samples to check out and/or show to potential clients. You can download the business packet here.